Flame painted contemporary designs rendered on copper to create unique, handmade wall sculptures and decor. Advanced techniques integrate buffed & textured aspects that deliver award winning fine art. 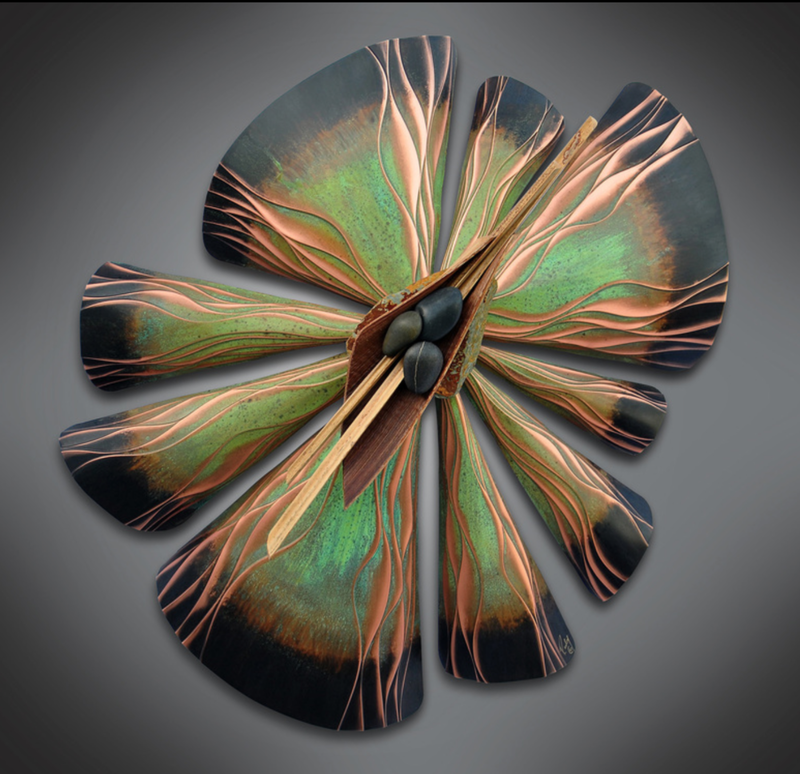 Greg Gowen’s work is created using copper, brass, bronze, and steel metals, formed and assembled by various welding, metal spinning, and hammer shaping techniques. Finishes applied by patinas and flame. Hand formed,patinated and burnished contemporary copper wall sculpture by third generation coppersmith. Included are stone, wood and other found materials. all work is sealed for outdoor display. I work on aluminum with epoxy resin and many media. The art is layered in several layers of epoxy. It is luminous and has a dimensional effect. Pieces are made using venetian plaster, gourds, topical feathers. Environmentally conscious art that uses reclaimed and vintage wood as canvas. Mixed media, consisting of paint, ink, untraditional digital transfer, and Laser etching. I sculpt and layer with laser-cuts, resin, metal, found items, sculpted clay, stones and crystals. Pigment prints, oil stick and encaustic paint; resin and powdered pigment mounted to aluminum/wood. The wax is fused with heat and creates layers of color and texture. Original watercolors are embellished with stained glass, gold wire, textured paper and handlettered verses in shadowboxed mats. Watercolor on 300 lb Arches using techniques of wash, dry brush, splattering, with effects from salt, alcohol, adding gold leaf into the composition, then mounting onto canvas, with a clear coat over. Leatherwork designed and created by Sandy Meyer, honing my art for 40 years. purses, belts, bracelets, boot art using all types of leathers and metal garnish...roots of the west and a fashion flair. I used a combination of painting techniques, photography, and illustration both digitally and traditional mixed media to create layers of visual interest in each piece of artwork.